Lone Survivor Foundation provides a high impact program lead by licensed trauma experts for veterans, active duty service members & their families. 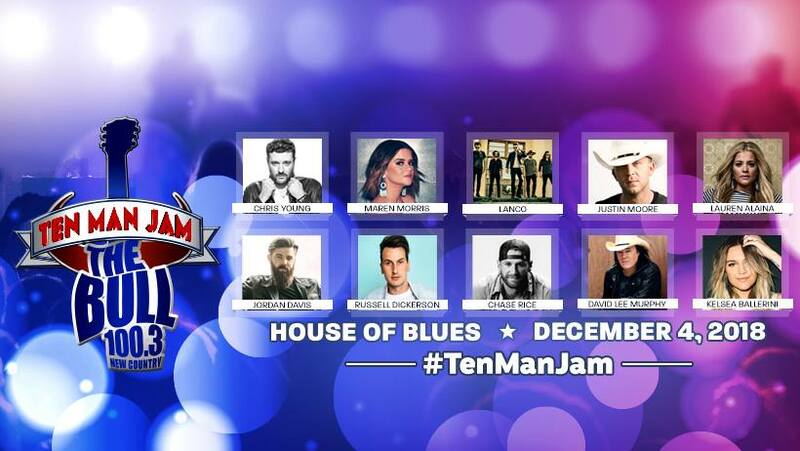 Our friends at 100.3 The Bull in Houston are hosting another Ten Man Jam in 2018 benefiting Lone Survivor Foundation. We are so grateful for their continued support of our veteran community! This year’s artist line-up includes: Chris Young, Maren Morris, Lanco, Justin Moore, Lauren Alaina, Jordan Davis, Russell Dickerson, Chase Rice, David Lee Murphy, and Kelsea Ballerini! The event will take place on Tuesday, December 4th at the Houston House of Blues. You can’t buy tickets – you can only win them! Tune in to 100.3 FM in Houston, listen online at thebullradio.com or come out to the ticket stops listed below to win your tickets! To register to bid on guitars signed by this year’s Ten Man Jam concert, visit www.lonesurvivorfoundation.org/tmj18. All proceeds benefit Lone Survivor Foundation!